So Many Ways to be Delectable! During our harvest season -- usually August through October -- we sell certified organic fresh apples at the Salt Spring Island Saturday and Tuesday markets, as well as at our farmgate. Our fresh apple sales culminate in late September or early October at the Salt Spring Island Apple Festival, where we sell hundreds of pounds of apples of dozens of different varieties. Because most of our apples are dedicated to cidermaking, we have a limited supply of fresh apples to offer for sale. 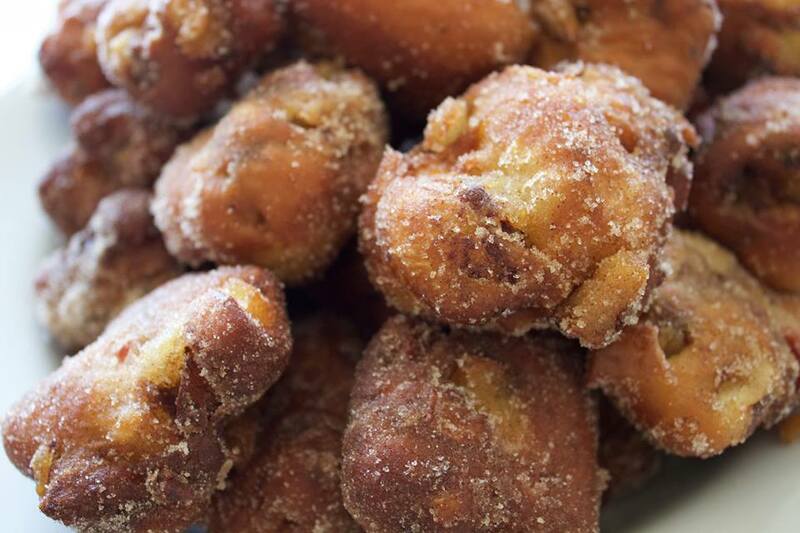 From the first Saturday Market of each year in March or April through the end of our market season, we bring lot and lots and lots of apple fritters each week, made with our own certified organic apples. Whether you scoop up a bag of our regular fritters (each weighing in at a modest 40 grams before they're cooked) or reward yourself with a magnificent King fritter (120 grams of apple and frittery deliciousness), you're going to find it a memorable experience. We have customers who visit Salt Spring Island just once each year, making a bee-line straight to our market stall as soon as they arrive to enjoy one of our spectacular fritters. How can something this simple be this delicious? Our organic apple chips contain exactly one ingredient: organic apples from our own Salt Spring Island orchard. Nothing has been added or subtracted (unless you count apple cores! ), leaving you with the super-concentrated apple flavour and lots of goodness. It takes about a pound and a half of fresh apples to make one of our small (60 gram) bags of apple chips and well over three pounds to make a large (140 gram) bag. We're pleased that our apple chips are now certified organic, your guarantee of their goodness. Also look for our apple chunks, the same wholesome dried apple, but in tiny cubes -- perfect for adding to granola, topping yogurt, being used in baking or just munching.